Pear Tree Cottage: Our Very Own Mini Woodland Path!! Our Very Own Mini Woodland Path!! As the snowdrops had faded and now is the very best time for dividing and moving them, Chris and I set to work moving the biggest clumps to allow us to lay a simple woodland path. As snowdrops prefer to be planted in the green, it's perfect timing and, with any luck, we'll enjoy carpets of them next spring a little higher up the border. As we'd emptied the old wood chip from the Hennery we had the perfect base for a woodland path. It even looked weathered. The Hellebores and Pulmonarias look so lovely against the limey green wild Euphorbias - I know it's not a woodland path in the true sense of the word but, it's the nearest I shall ever get and I love it! With the Symphitum, Epimediums and Narcissus all in flower either side and Lilies-of-the-Valley lying in wait, I couldn't be more pleased! This path is also pretty vital at the moment as the main path is out of bounds until the grass seed germinates and it's the main route to the compost heap! 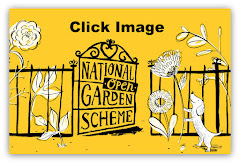 Historically this border never enjoyed any access at all and plants could only be viewed at distance from the lawn. It's so much nicer being able to walk between them and down to the new steps built by Chris G in compost Corner - especially at this time of year.